It is safe to assume that nearly – if no one – at all expected the problems that eventually occurred. The problem(s) that I faced were not outwardly apparent as much of it was internally harvested over a period as I walked a path I thought was safe according to what I considered true. I did not realize that every step on this journey was leaving me a crimson stain after a crimson stain. The effects of this journey resulted in a separation between the biblical truths that I learned as a child and a genuine loving relationship with Him without even realizing until I faced a decision that was life changing. Sometime during my 7th or 8th grade, I mentally checked out of the church (I still learned things but I seemed only to go due to obligation and necessity) I was attending. In addition, in some degrees I ignored what I was taught to accept which amounted to altered truths (and to consider that is up for consideration). The phase of checking out did not end well, of course. Within about a year, I found myself in a situation that changed my life. I wish this pivotal event had only sent an earthquake through my life, but this decision included others. As a result, some of the side effects rippled to those that I find the dearest. The decisions preceding the linchpin event seemed to add individual dark clouds above me that made me feel like God was not around. Thus, when that earthquake occurred, I believed He was nowhere to be seen. As a result, I hit a point where I believed I created my own prison. 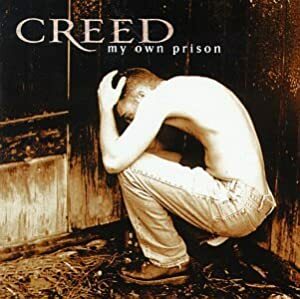 Cover Art for “My Own Prison,” by Creed. It is truly difficult for me to convey the mental and emotional road I went through from hitting rock bottom to realizing where God had been the whole time. As I spent time deliberating how to put thoughts into words, I could only refer to the song “My Own Prison” by Creed. As a result, I will let it speak for me as it represents the story that preceded immediately after. It is clear that it is our decisions and actions that result in crimson stains that push Him away. However, crimson stains do not mean He wants to be separated from you. I struggled to understand two important things. First, He desired to have a personal relationship with me. Secondly, that He would never leave or forsake me (Deuteronomy 31:6, 31:8, Joshua 1:5, 1 Chronicles 28:20). It took me some time to realize that it was not God that left me, but that I left Him. It was my decision to take Him slowly for granted and ignored the fact I had to put my faith into action. The reality is that not being proactive caused the relationship become neglected. As a result, like any relationship would, it became nothing but a ritual. I was initially overwhelmed and had no idea what to do. But I soon realized that my heart was aching in an abyss that I could not resolve myself. I have come to realize that the mental state I arrived at was not caused by others, but by my decisions and actions. The time that has gone by caused me to recognize that reaching bottom, and wanting all the pain fixed was the anointed time for His purpose to be done in my life. As a result, I began to question the world’s truths and Gods truth. The questions revolved around answering the overarching question: if I “really believe[d], that what [I] believe[d] is really real?” (Thank you to Dr. Dell Tackett for putting my thoughts into words). It was recently that I realized that it took me time to trust Him like a good father. This occurred through me equating a relationship with God to be like the of one I did not have with my earthly father. However, I never truly fully grasped it until one night while serving the high school ministry event during a group discussion. I have learned through my own struggles how important it is to fully give up matters to Him. It is our human desire to control everything in our lives. Thus, trusting Him can arguable be the hardest thing to do for anyone. It was during that night serving that I fully let the problems I faced in the past go. These problems held me back at the same time as they have helped me to learn how I have to trust Gods faithfulness, His love for me, and how He will help me in my time of weakness. This is the reason the song “I Will Trust You” (Chris Lizotte) has become one of my all time favorite songs as it is a healthy reminder for me to trust in Him alone.